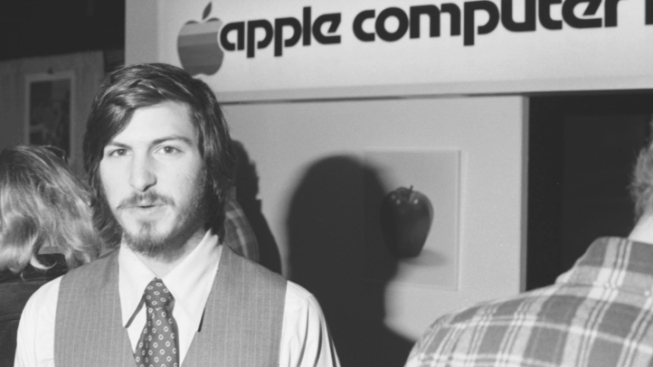 Many people know Apple co-founder Steve Jobs as an exacting tech visionary. Fewer know him as a romantic, a poet or a costumed "Alice in Wonderland" character at a California shopping mall. These latter characteristics help make up the portrait of Jobs painted by his first serious girlfriend, Chrisann Brennan, in a "Rolling Stone" story that was shared exclusively with The Associated Press before hitting newsstands Friday. Brennan and Jobs met in 1972, when he was a senior and she was a junior at Cupertino's Homestead High School. In the piece, she recounts her adventures with a 17-year-old Jobs that summer, from moving into a cabin together to getting paid to portray "Alice" characters at a local mall. Jobs died Oct. 5 at 56 after struggling for years with pancreatic cancer. After taking his third medical leave from Apple Inc. in January, he resigned as CEO in August, but stayed with the company as chairman. His death came a day after Apple unveiled the latest iPhone, the 4S, which goes on sale Friday. Brennan's on-and-off relationship with Jobs lasted until the birth of the couple's daughter, Lisa Brennan-Jobs, in 1978. She says the duo decided to live together that first summer. She tried to snag a room in a Cupertino cabin for them but was turned down by the man renting the place at the time - he said there wasn't room for a couple. Somehow, Steve was able to persuade him to change his mind. "This alerted me to something remarkable in him," she writes in the "Rolling Stone" essay. "This guy could make things work. And from the way he'd taken charge of the situation, I knew he knew it too." At the time, Brennan says, Jobs "was almost 100 percent romantic." "He would tell me we were part of an affiliation of poets and visionaries he called 'the wheat field group' and say we were looking out a window together, with the others, watching the whole world," she writes. "I did not know what he was talking about, but with all my heart I wanted to see such views." Brennan also recounts how Jobs - who hung a Bob Dylan poster over their bed - would stay up late writing poems on his electric typewriter, often re-writing Dylan tunes. At the time, Brennan wasn't impressed, seeing the results as "a lot of Bob Dylan songs with a few changes." "Only now do I see what he was trying to do. He was a loner and he didn't talk much, and I think he used Dylan's songs to make sense of the world," she writes. On the sillier side, Brennan details how she, Jobs, a roommate named Al and Steve Wozniak (who later co-founded Apple with Jobs) played "Alice" characters at a mall in nearby Santa Clara. Brennan got the part of Alice, while Al, Jobs and Wozniak took turns playing the Mad Hatter and White Rabbit - complete with knee-length giant heads that were incredibly hot because of the summer heat and the mall's broken air conditioner. Brennan writes that Al, Wozniak and Jobs "could barely handle 10 minutes in costume, and so they would run into the dressing rooms to trade off heads and to drink water every 10 minutes. It was painful and hilarious to watch." Not all of Brennan's recollections were friendly. In the "Rolling Stone" essay, Brennan refers to "the all-too-often despotic jerk Steve turned into as he rose to meet the world." For two years, Jobs denied that he was the father of Lisa, the child born to Brennan in 1978. Brennan's piece will run in "Rolling Stone" alongside a cover story by Jeff Goodell, an early Apple employee who has written about the company for the past 17 years. In his article, Goodell describes Jobs' business savvy, as well as the "abrasive personality" and "unapologetic brutality" that those who worked intensely with him experienced. Rachel Metz is a technology writer for the Associated Press.